We live in an age when acoustic music is regularly translated into digital information that is often tweaked, edited and "managed" beyond all recognition. Most studio recordings are the compilation of the best portions of three or four takes. Even performances "recorded live" are sometimes "revisited" in post-production in pursuit of perfection. In my experience, the "perfect" performance rarely happens, so it's a bit daunting to present unedited live performances here (with the Bach D-Minor Concerto and the Saint-Saëns Duos as the two exceptions) with the inherent bumps, background noises and coughs, and the odd wrong note (always in the worst place!). These inevitabilites aside, there is a certain energy and communication from live performances and I'm happy to present a wide variety of music for piano, harpsichord and organ. As circumstances permit I will change the musical offerings here from time to time. Please come back! To listen, click on the title of any piece, and when it's finished, use your browser's "back" button to return to this page if you want to listen to more music. 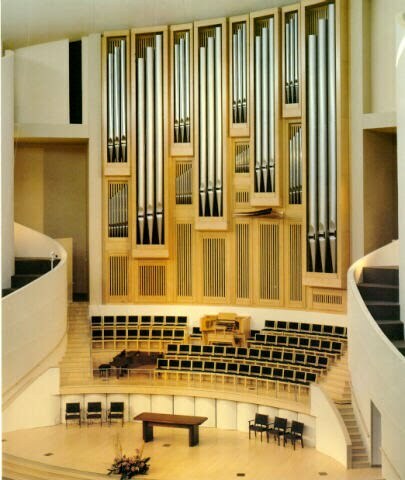 Organ Music from the Community of Christ (formerly R.L.D.S.) Auditorium and Temple in Independence, Missouri. Casavant Frères, Op. 3700, 1992. IV/102. Bach on the Bamboo Organ was recorded as the last 'event' of nearly a month's work of preparation and performance at the twenty-first International Bamboo Organ Festival in 1996. Manila is another city, like New York, that doesn't sleep, and the constant traffic outside the walls of St. Joseph's Church in Las Piñas required the recording sessions to begin at 2 a.m. (!) Even at this early hour, police and festival volunteers had to stop traffic on the busy road while we recorded as much as we could before impatient motorists complained with their horns. We would stop for a few minutes and then try our luck again and take up where we left off. Although this recording contains edits and is not technically a "live" performance, given the time restraints to get everything on tape we were not allowed to go back and re-record ... we had to get it right the first time. No pressure! As this recording is out-of-print I've taken the liberty of including the entire concerto here. The "clacking" noise you hear on the recording is the organ's primitive key action. Please take a moment to check out the above link and learn more about this charming and noble instrument.